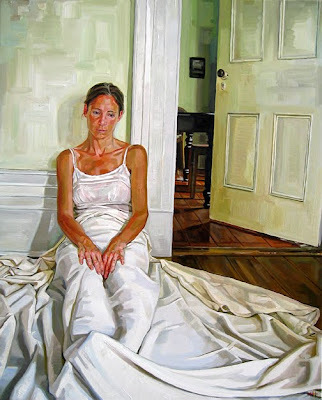 "Gayle With Sheet", Oil On Canvas, 30"x24"
Last week I had the opportunity to speak at Georgian College in Barrie, Ontario. I was asked to be a guest lecturer for the fine art student body and some faculty. It was exhilarating yet a bit terrifying as well...which I suppose is a good thing. Adrenaline can do such wonders for the mind as well as the body! The purpose of this lecture was to discuss and talk about my background, past work, present projects, accomplishments and anything else pertaining to the life of a full-time artist that the students might enjoy learning about. 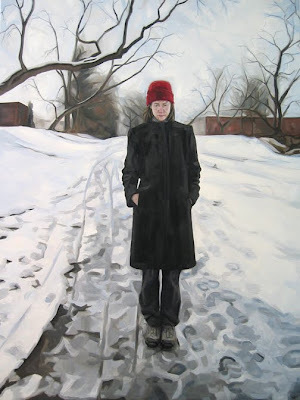 I have included some images in this blog of paintings that I showed to the audience. 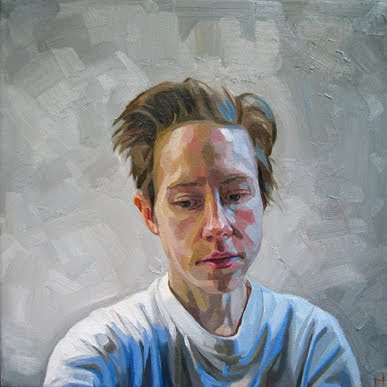 "Bed (head)", oil on canvas, 12"x12"
I had a lot of fun preparing the lecture, partially because I was able to use Power Point finally. It was so straightforward and I almost couldn't believe it was a Microsoft product! All bias aside, I had a great time organizing, planning, editing and honing the talk around slides of older and present work, a brief bio and selected quotations that keep me inspired and moving forward when there are inevitable but rare dips in enthusiasm about one's work. "Coming", oil on canvas, 48"x36"
The talk went really well and I was quite excited to see that a total of about 115 people attended the lecture! All of the chairs were taken and people were sitting on the floor and standing at the back of the gallery where the talk was held. I had a microphone. I had a laptop. I was ready...so I dove in and began to talk about what I do and why I do it. After some initial nervousness I settled into speaking earnestly about how I came to be a full-time painter: how in college a small group of us decided to embark on a more traditional route of approaching our work as we had a calling to do more studio/gallery work than commercial work...and the beautiful thing is that our instructors at Sheridan College supported and encouraged this rerouting of creative spirit. I will never forget that. 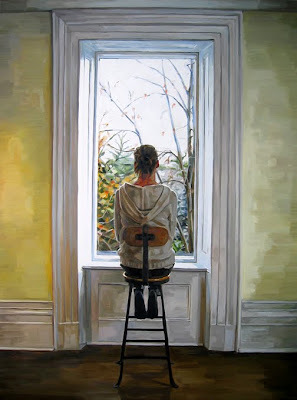 "Gayle (stool)", oil on panel, 48"x36"
The main point that I tried to emphasize to everyone listening is what we have heard time and time again: that anything that we dream of is possible, that we can do whatever we want with our lives, with our careers as artists and creative people, that the only limits are those which we place upon ourselves. I was pleased to see some people nodding their heads and some were jotting down notes too. I spoke of the value of discipline and most importantly, I stressed to the listeners to find out what makes each of them unique as creative people, what sets them apart, and to capitalize upon that. The key is finding that beautiful and individual ingredient within each of us...and cultivating it. 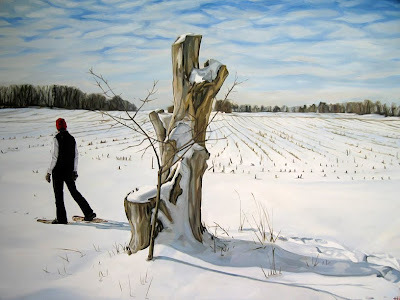 "Gayle, Snowshoeing", Oil On Canvas, 36"x48"
Speaking to these artists was very rewarding. I spoke to a few people afterwards who wanted to talk briefly and I was pleased to hear that they enjoyed the talk and were inspired. There's no greater feeling than to inspire another artist to pick up their brush or approach the copper plate with more gusto! There was a certain bliss felt in that moment, in speaking and communicating verbally what you are compelled to do with your life and work. I look forward to doing more lectures and speaking engagements in the future! 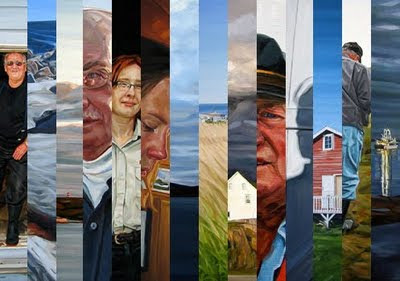 I can hardly believe it but the Newfoundland Portraits Exhibition is less than three weeks away! I will be doing an informal artist talk on November 14th at Abbozzo Gallery from 2-4pm where I will speak about the creation of the paintings and the journey to Newfoundland. I hope to see you both at the opening and at the talk! some East Coast-inspired songs for your enjoyment!